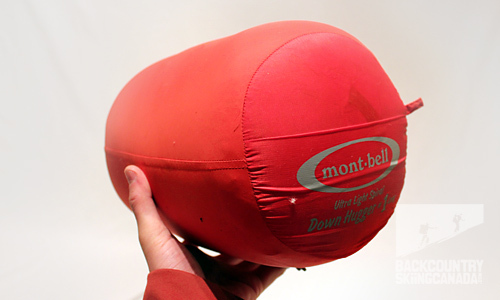 Montbell U.L. Spiral Down Hugger #1 Sleeping Bag has been my bed buddy for a number of camping and backcountry skiing hut trips this year. 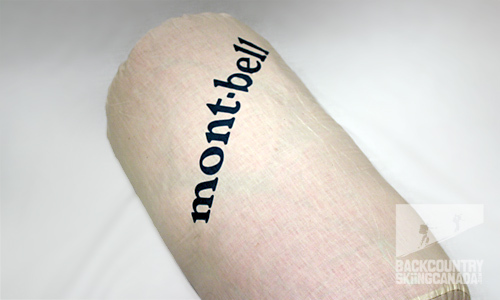 Montbell has put a unique spin on the mummy bag concept using a number of innovations that have left me waking up on the right side of the sleeping pad. 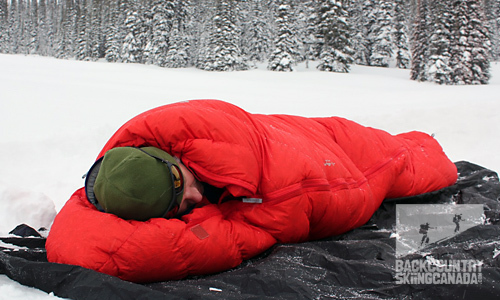 This is the kind of 3-season sleeping bag I would use on winter backcountry skiing hut trips and spring/fall camping trips as well as summer high altitude camping. Because I need to haul it in it has to be light-weight and because I am often sleeping in below 0ºC temps it has to keep me warm at night (a night sleeping cold is a night without sleep). So how does the Montbell U.L. Spiral Down Hugger #1 Sleeping Bag stack up? MontBell has a "Light & Fast™" philosophy. They have been in the industry for over 37 years now and have Japanese mountaineer, Isamu Tatsuno, as their founder. With true Japanese integrity they take their philosophy seriously, in this case by utilizing ultra-light and ultra-thin fabrics such as 15-denier Ballistic Airlight nylon. With it's tight durable weave it has high wind resistance (warmth) and it also happens to feel silky soft (see comfort). In combination with the Ballistic Airlight nylon Montbell use Premium 800-fill goose down, the high fill power here provides more insulating ability for it's given weight of down, so the 800-fill optimises low weight without compromising warmth. On top of that, the high fill rating results in higher loft so the compressibility is greater and therefore this sack will take up less space in your pack. At 2 lbs. 5 oz. it's no burden to carry and comes in lighter than many other bags in it's class. I've already mentioned the weight optimising capabilities of Premium 800-fill goose down and how it is high loft. The high loft creates and abundance of airpockets which means greater insulation and therefore warmth. There are a few other features that Montbell has included in the design to enhance the functionality of the down and increase warmth. Box Construction: There are no sewn-through seams. Instead each baffle of down is contained by an interior piece of fabric on each side creating a 'box' shape. This allows down to loft completely and eliminates cold spots resulting from sewn-through seams. Tunnel Hood: a small face hole to improve warmth around your head and face with draw cord for face hole adjustment. Beefy Neck Baffle: a down-filled shoulder collar prevents air circulation through top of the bag, includes drawstring to really seal things off. Draft Tube: a down filled double draft tube prevents air from circulating through the zipper. 25˚F/ -4˚C(Comfort) - Based on the lowest temperature at which a “standard” adult woman is deemed able to have a comfortable night’s sleep. 14˚F/ -10˚C(Lower Limit) - Based on the lowest temperature at which a “standard” adult male is deemed able to have a comfortable night’s sleep. -21˚F/ -29˚C(Extreme*) - This survival rating using the “adult woman” standard and they don't advise for it to be used for general use. In other words you could survive at this temperature in this sleeping bag but you won't be sleeping—it just ain't made for that. 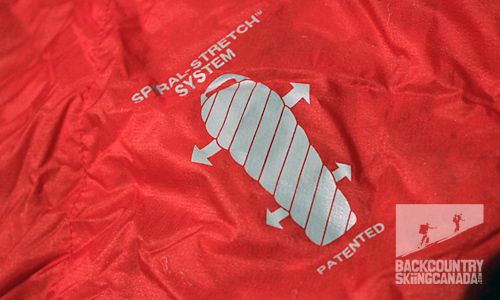 Where Montbell have truly innovated the sleeping bag formula is with their unique Spiral Stretch System. Basically the Spiral Stretch combines bias stretch, gathered quilting, and elasticized baffles so that it has built-in flexibility to move with you. This means if you are a side sleeper or you move a lot during the night the bag will move with you and cold cavities within the bag are eliminated as it hugs you. The stitching of the fabric actually has 20% stretch due to elasiticised thread. The level of comfort created through the flexibility is topped off with the Ballistic Airlight nylons silky feel and the puffy high loft down. Auto Locking Zipper: a locking mechanism has been integrated to limit zipper “slip” during the night (this resolves a problem with earlier models of this bag). Tapered Stuff Sack: A tapered opening and "bias cut" fabric are utilized to facilitate easier packing. Cotton sack included for storage when not in the field. 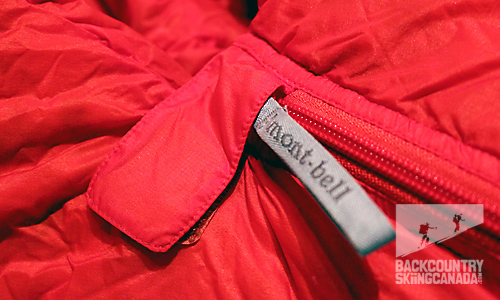 I worked in a gear store a few years back, at that time we carried two brands of sleeping bag, one line for the car camping crowd and infrequent backcountry visitor and the other line was Montbell for the more serious backcountry enthusiast who wanted super light-weight and high performance. My experience with the Montbell U.L. Spiral Down Hugger #1 Sleeping Bag in the last few months is consistant with my early perceptions of Montbell. That is, Montbell excel at making sleeping bags. Whilst they are in the higher price range for a bag, you really do get what you pay for, in this case, quality and performance. I carried the bag on the Wapta traverse for five days. It was light, allowed for loads of extra space in my pack due to it's compressibility and at the end of each day it was a dream to sleep in. It's full of high-loft downy goodness (do they over stuff this bag?). Most of all the spiral design is genius. I'm a side sleeper and this bag can accomodate me moving around at night so I didn't feel strapped-in as I have felt in other bags. 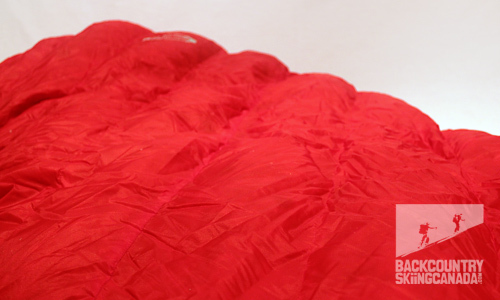 If you like freedom to move this is the sleeping bag for you—it's roomy and flexible. Some camping nights my sweetheart and I like to share a sleeping bag duvet style so we can cuddle. We tried to share the Montbell U.L. Spiral Down Hugger and made it work but found the zipper finished a little high for this kind of improvisation. 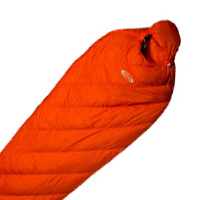 Montbell do have Left Zipper Sleeping bags that will match up but the U.L. Spiral Down Hugger comes Right zip only so you would have to choose another model. The only other thing that I missed in the U.L. 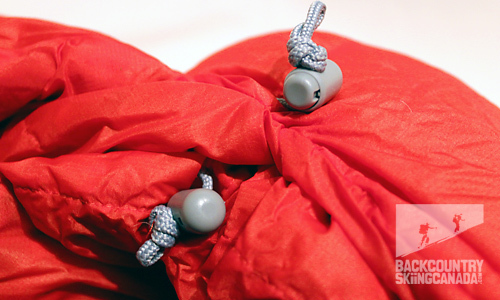 Spiral Down Hugger was an interior stash pocket which I usually use for earplugs ( a must on cabin trips). Light to carry and light to sleep in without compromising on warmth. 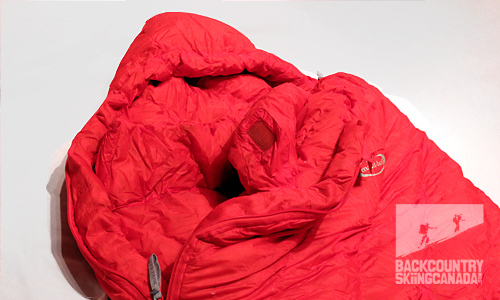 Spiral stretch is an antidote to sleeping bag claustrophobia as it makes the bag feel extra roomy. Incredibly comfortable. No interior stash pocket (handy for earplugs etc). I prefer to use a compressing stuff sack instead of the one that came with the bag so I can create more space in my pack. For more Mont-Bell reviews have a click on over here to read the review of the Snow Banshee Hoodie soft shell jacket, the Mont-Bell Dynamo Wind Parka and the Mont-Bell Frost Smoke Down Parka.